Quite often, an innovation made for a specific problem has an application beyond the initial purpose. 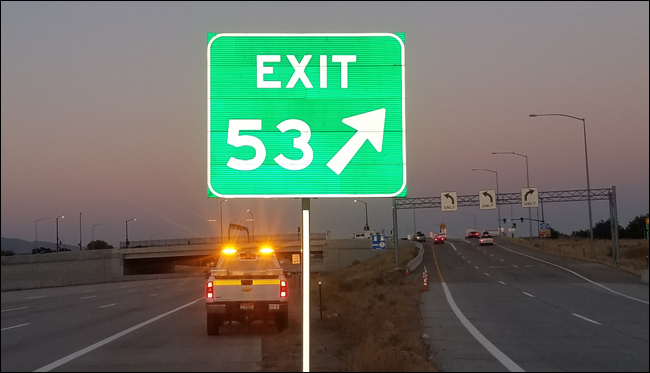 For instance, when the sign at Exit 53 at Orchard Street in Boise was getting hit too many times, the Headquarters Sign Shop located at District 3 went to work on a solution that not only saves the department money from having to fix or replace the damaged sign, but also is a safety enhancement for the motoring public. It also has a Times 7 application — it can be used statewide. Brett Purvis (Sign Shop Coordinator), Mason Grubb, Paul Hart (who has since left ITD) and Kyle Hobeck of the Orchard Maintenance Shed decided to include a prismatic silver stripe down the front and sides of the post. 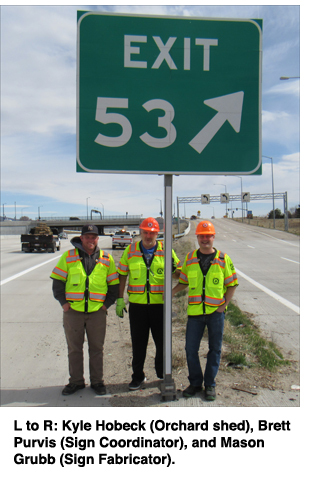 In July 2018, they installed the new higher-grade sign. At night, this sign is several times brighter than the old sign had been. In the span of two years prior to the application of the prismatic sheeting, that particular sign had been struck at least a dozen times. For the safety of drivers, ITD added the brighter reflective tape for better guidance during night driving. Since installing the striping, it has not been struck in eight months. Purvis estimates the savings at about $7,500 per year, with corresponding savings in hours from workers not having to fix and reinstall the sign.